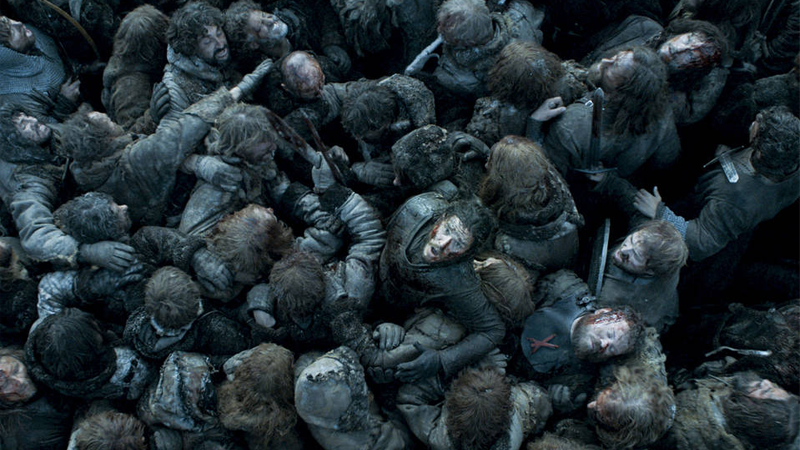 Who would’ve thought that between the combined powers of Game of Thrones and The Walking Dead there’d be a giant pile of dead people? I for one am shocked. Yes, two of TV’s bloodiest shows have racked up quite the body count over the years, as noted by this nifty chart from Reddit user nachorykaart. Nachorykaart took the first five seasons of each show—to keep it relatively even between the two shows, since The Walking Dead has run for a little longer than Game of Thrones has—and noted every time someone (or something) died on each show, or was heavily implied to have died off-screen. Check it out in all its gory glory below. Perhaps unsurprisingly, Walking Dead easily tops Game of Thrones—in terms of killing main and ancillary characters, the shows are at fairly similar tallies, but the free reign Walking Dead has to kill a bunch of zombies every week easily bumps up its total in ways Game of Thrones couldn’t in its first five seasons. Maybe if we get to see a giant White Walker invasion of Westeros in the show’s climactic seasons it could catch up. But there’ll always be walkers to kill in TWD to more than make up for it.